The Commission recently co-hosted the 5th Australian Public Sector Anti-Corruption Conference (APSACC), which was held in Brisbane last month. The ICAC is a founding partner, along with the Western Australian Corruption and Crime Commission and Queensland’s Crime and Corruption Commission. 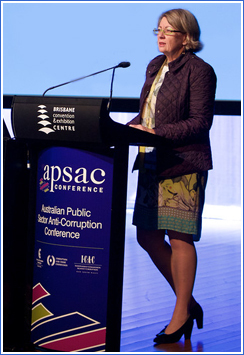 Since the inaugural conference was held in Sydney in 2007, APSACC has grown to become recognised as Australia’s premier anti-corruption conference. This year’s event attracted nearly 500 participants, from more than 10 countries. I’m sure many Corruption Matters subscribers would have attended the conference, and I hope that you found it to be informative and thought-provoking, and that you took away enhanced skills and approaches to tackling corruption. Conference papers and presentations will be available from the APSACC website, and I encourage readers to have a look through them. You can also sign up for future information bulletins about the next APSACC, which is planned to be held in Western Australia in 2017. If you are interested in corruption prevention, I recommend that you get involved; it is a valuable learning experience. 2015 has been a busy and challenging year for the Commission. As I noted in my last Corruption Matters editorial, the NSW Government had engaged the Hon A M Gleeson AC QC and Bruce McClintock SC to conduct a review of the Independent Commission Against Corruption Act 1988. That review is now complete, and resulted in four key changes being made to the ICAC Act, which were assented to in September as the Independent Commission Against Corruption Amendment Act 2015. The purpose of the amendments is to (1) clarify the definition of corrupt conduct, (2) enhance the Commission’s corruption prevention functions, (3) give the Commission a new power to investigate specified offences referred to it by the NSW Electoral Commission and (4) limit the Commission’s power to make corrupt conduct findings to serious corrupt conduct. You can read more about the changes and what they mean in this article, but in general terms, it is business as usual for the Commission. Our ICAC Annual Report 2014–2015 shows that we dealt with more than 3,000 complaints and reports, and reduced the time it took to deal with them. We commenced 42 new preliminary investigations and 14 full operations, and completed 40 preliminary investigations and 11 operations. We conducted seven public enquiries over 64 days, held 127 compulsory examinations over 58 days and furnished five investigation reports to Parliament. The Commission also made corrupt conduct findings against 17 people and recommended that the advice of the Director of Public Prosecutions be sought with respect to the prosecution of 13 people. Corruption prevention, training and advice also had a busy year, with our trainers travelling across the state to deliver 194 anti-corruption training workshops, reaching more than 5,300 people face-to-face, plus managing 134 requests for corruption prevention advice. We’ve also just conducted an outreach visit to the Blue Mountains, in which approximately 100 people participated in activities and workshops. We published recommendations to help mitigate corruption risks in the regulation of election funding, and initiatives to help improve the management of corruption risks in universities’ dealings with international students. As 2015 draws to a close, I would like to take this opportunity to thank readers for their interest in the Commission and its work, and for helping us to keep up the fight against corruption in the NSW public sector.